How to Acknowledge & Honor Deceased Family Members in a Wedding. There are many ways to honor a deceased family member or loved one in a wedding. Below are a few suggestions. Set up a small table at the wedding reception with a flower arrangement and a card saying “In memory of those loved ones who are not with us today” or more specifically, “In memory of Martina Jensen, mother of the bride.” You could also put a picture of the bride or groom with the deceased person you are honoring. Place a flower on a seat in the front row, and/or a picture of the deceased family member. It can remain unmentioned or the minister can refer to it at a certain point in the ceremony. 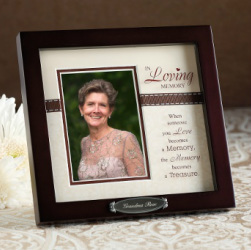 Place a photo of the deceased family member on the altar or near the unity candle table or sand ceremony table. Place a memorial candle which the bride or groom (or both) will light at the start of the ceremony. A picture of the deceased family member can also be placed next to it. Include in the program that the memorial candle is being lit in memory of ___________. In response to the question, "Who presents this Bride in marriage?" the response might be, "In memory of her Father ____full name of Father here____ I do." After welcoming the guests, the minister can say, "Before we begin our celebration today, the Bride and Groom would like us all to take a moment to remember those family members who can be with them today solely in spirit, especially mother of the bride ________. Bride appreciates all of the love and support _______ has given her throughout the years and would like to take a moment to remember her today. There is then a 10 second pause. Before the vows the minister says, before we continue, the Bride and Groom would like us all to take a moment to remember those family members who can be with them today solely in spirit, especially mother of the bride ___________________. There is then a 10 second pause. Compile a floral centerpiece. Have a vase on the altar, or at the back of the ceremony site. Give each guest a white flower as they enter and have them place it in the vase at a certain point in the ceremony. When you get to the last flower it is announced that it will be placed in the vase in memory of the deceased family member. As a final symbolic gesture, the bride and groom can each insert a red rose into the center of the arrangement, signifying the couple being surrounded by the love and support of their family and friends. The arrangement can be used to decorate the head table or in another location at the reception. Incorporate butterflies into your ceremony which are released at a certain time. If you are considering using candles to honor a deceased family member click here sample memorial accessories. If you will be having a wedding program you can have a page or paragraph dedicated to the deceased family member (preferably a picture with the bride and or groom). You can write something like: Today, we keep in our hearts those who celebrate with us in spirit. Then write all of the names of family member who are deceased along with their relationship to the bride or groom. Or just write the name of one deceased family member. Light a memorial candle during a special song or poem. In the program you can have the song / poem printed in memory of your deceased loved one or in loving memory of ________________. If you would like to share your idea or suggestion with us please send it to nick at treasuredceremonies dot com. Helping couples create the most memorable, unique and beautiful wedding ceremony they have ever imagined.